At first, you don’t believe what you’re seeing. Secodontosaurus (Fig. 1, Cope 1880) looks like a varanopid skull grafted onto a sphenacodont body, complete with dorsal sail. And there’s a genetic reason for that. It’s not modular evolution, although it seems like it at first. It’s more like a reversal because there’s a long line of other taxa between Secodontosaurus and Varanosaurus. And they left their genetic markers too. Figure 1. Secodontosaurus and its ancestors going back to Varanosaurus. Secodontosaurus is the only sphenacodont with a varanopid-like skull. Long low rostrum. Naris close to jaw rim. Strongly concave dorsally dentary. Quadratojugal greatly reduced in Secodontosaurus. Lacrimal does not contact the naris. Reflected lamina on angular. Loss of mandibular fenestra. Posteriorly shorter postorbital, not in contact with supratemporal. And that’s just for starters on the skull alone. If anyone has good refs for the post-crania, I’ll complete a reconstruction. There have been some additions and revisions to reptileevolution.com around the synapsids as I’ve added new taxa recently. Cope ED 1880. 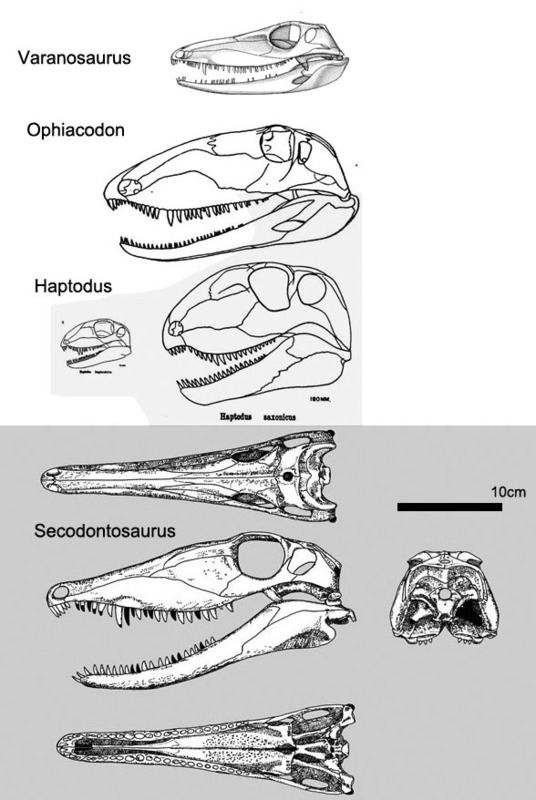 Second contribution to the history of the Vertebrata of the Permian formation of Texas. Proceedings of the American Philosophical Society 19:38-58. This entry was posted in pelycosaur, Permian, reptile family tree, synapsid and tagged pelycosaur, permian, synapsid by davidpeters1954. Bookmark the permalink.